I started working in restaurants when I was in college. The first was a café on campus. I made milkshakes, pizzas, burgers, and lattés for masses of sleep-deprived, starving college students. I like to think that I did my part to nurse hangovers and fuel all night study sessions. The next place of employment was at a classy restaurant off campus where they graciously trusted me to work behind the bar. I had had exactly zero experience mixing drinks, but they were very patient with me and helped me to learn the basics of cocktail mixing, stirring, shaking, and everything in between. They never said I did a bad job, which is either because they wanted to spare my young college-girl feelings, or because I wasn't terrible. After a while, I moved on to waiting tables at the same restaurant, which I much preferred. Still, I attribute much of my initial interest in cocktails to La Rana Bistro in Decorah, IA. If you ever find yourself in that area of the U.S., I highly recommend stopping in Decorah. It's a sweet little place and much more beautiful than most people expect for that part of the Midwest. I didn't learn to make this particular cocktail while working at the bistro, but I did think about my time in Iowa the first time I made it. Something about the honey-lavender syrup made me think of, as the sign says when you enter the state of Iowa, "Fields of Opportunities". It's funny how a scent can bring you somewhere totally unexpected. As far as I know, there aren't lavender fields anywhere near Decorah, IA, but with the first whiff of the dried flower I was transported there anyway. That's the thing about food. Or drinks, in this case. Sometimes the smell or taste brings you someplace you didn't know you needed to go. I haven't physically been to Decorah in quite some time, but I welcomed the brief reminder of a place so dear to my heart. So, a little about this Lavender-Honey Sidecar. The recipe for this lovely cocktail has been calling my name for a couple years. I only just got around to trying it out a little while ago and immediately smacked myself in the forehead for not doing it sooner. The original recipe calls for brandy, but I didn't have any on hand. Then I remembered a whiskey sidecar that I had on a visit to the Brown Palace in Denver a while back and decided it might work well here. Fortunately, I was right. I'm pretty picky about my whiskey cocktails but this one was right up my alley. 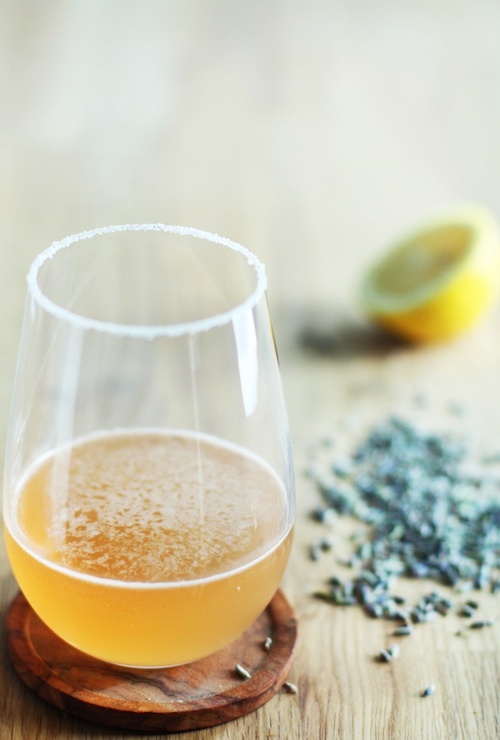 Softly floral from the whiskey and the lavender, with the gentle sweetness of honey which was cut by fresh lemon juice and a splash of Cointreau. I am sometimes wary of cocktail recipes that incorporate ingredients easily mistaken for a cold remedy, but this was perfectly balanced and clean on the palate. Even my whiskey-loving husband enjoyed it! My recommendation for this weekend? Sit back, enjoy the smells, sounds, and sights around you, and see where your mind wanders. Fine white sugar or granulated sugar for the rim of the glass. Put your sugar in an even layer on a small plate. Use enough so that when you dip the glass in the sugar, enough will collect on the rim to be visually appealing. I usually use about 1/3 cup, even though not nearly that much ends up on the glass. Using your clean finger, put a dab of honey on the tip and trace the edge of your cocktail glass, making sure the honey is in an even, consistent layer but without clumps. Turn the glass upside down in the sugar to coat the honey and gently turn right side up. Set aside while you make the cocktail. In a shaker, add the whiskey or brandy, simple syrup, cointreau, lemon juice and bitters. Fill the shaker to the top with ice and shake vigorously for about 30 seconds. Pour through the strainer of the shaker into your cocktail glass and serve immediately. Combine the honey, lavender, and water in a small bowl and stir to combine. Let steep for at least 30 minutes and up to an hour. Pour through a fine mesh strainer and use immediately, or store in an airtight container in the refrigerator for up to 1 week.